If you have or know a kid, you know they spend a lot of time drawing. And some of what they draw is a truly unique window into their brains, isn't it? 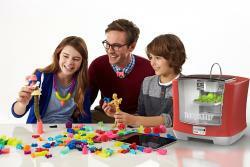 Mattel's ThingMaker 3D Printer promises to turn your child's drawings into actual toys they can play with! The old adage is "the sky's the limit" when talking about a great number of things, but even the sky cannot limit a child's imagination. If you've spent any amount of time with a child, you're familiar with the incredible artwork they can create, sometimes of everyday objects but more often of things they've seen in their minds brought to life on paper. Wouldn't it be neat to see some of those creations brought to 3D life? The Mattel ThingMaker was developed to do that very thing. Whatever your child can imagine and put on paper, the ThingMaker can 3D print for them to play with. Granted, you're not going to want to print everything they draw or you'd have to buy a second (or third, or fourth) house in which to store them all, but with some judicious selection you can fill your child's room with toys they've created for themselves, guaranteed unique and the envy of their friends. Don't worry if your child isn't quite a good enough artist to draw things that will hold up to real life playing, either. ThingMaker comes with a whole host of pre-designed toys, jewelry, and figurines to choose from as well. What would probably work best for most kids is to print some of the pre-designed objects, and then apply what they learn to their own drawings. Once your child is ready to design their own toys, all they need to do is fire up the free app (available now in the Apple App store and on Google Play for Android) and draw to their heart's content either on a tablet or through a web browser. Those drawings are then sent to the ThingMaker, and with a little patience they'll have a plastic replica of their drawing to play with almost before they know it. Safety is a concern for most parents, especially with a 3D printer that's going to be spewing out hot plastic. Mattel has thought of that, though... Each ThingMaker has a retracting print head to keep it away from prying fingers, and once printing starts there's an automated door lock that won't open until printing is complete. That not only keeps little hands safe, but keeps their creations safe as well since it won't allow them to remove whatever is being printed until it is completely done. And of course ThingMaker should only ever be used with adult supervision. For those who are wondering how big the ThingMaker is, at just 19 x 20 x 21 inches and barely over 24 pounds it should fit almost anywhere you'd want. And since it prints from the cloud, you don't have to worry about it being near enough your computer to run a cable... just put it wherever works best for you. Mattel recommends an age of 14-15 years, but that's for using ThingMaker by themselves. Younger kids can use it as long as you're there to help them and make sure everything goes all right. 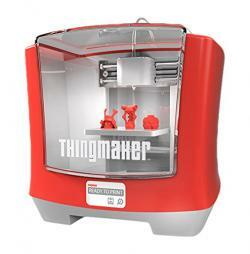 ThingMaker is available for pre-order now with delivery expected in mid-October. Price is $299.99 US for each unit, which comes with a starter kit of plastic (you'll definitely want more).